This amber is 100% authentic and natural. Butterscotch Baltic Amber Islamic 33. Great, all items are brand new. We never sell used products. 21.00 (grams) 0,74 oz. Main Stone Size (mm): 12x9. All items are created and delivered from Lithuania. Amber, as it has been attracting attention of people from remote times, is called Lithuanian gold. It is valued as a marvelous adornment because it reminds of warm sunshine. Ladies used to wear it with a great pleasure in ancient Rome and in the Medieval Ages in West Europe and Asia. Nowadays it is also fashionable and is being worn widely. Maybe because it is easy grind and polished nevertheless it as hard as a stone. Amber i s our gold. Amber is one of the few natural resources, which humans found as early as in primeval ages. Only amber deserves a special place among them. Flint, obsidian, jasper, jade and other gems were used only for producing weapons, hunting and working tools. Humans would not have been able to survive without them. Amber lying on the wet sand of the seashore must have attracted a primitives attention by its transparency, colour, or warm inner ray, which reminds of sunshine and fire. A primitive must have been impressed by the place of origin of amber sea, by its mysterious feature it flames emitting pleasant odour, as well as the fact that it is always warm when one holds it. Amber has been always an object of creating legends. It is being assigned magic characteristics of healing and protecting from evil. It has always been applied in producing jewellery, amulets, and ritual articles, firstly associated with the sun cult, because it is easy to work with using primitive tools: for shaping, polishing, burnishing or even drilling. Most of the oldest amber articles are a real piece of art, which demonstrate a high level of material culture and attitude of the people who used to use it.. For thousands of years the Baltic gem has been known as a precious stone, remedy, ornamental stone and incense. Its positive effect on human organism has been known thousands years ago and has been studied by famous ancient doctors: Hippocrates, Al Razi, Abu Ali IbnSina (Avicenna) and Paracelsus. Natural Baltic Amber has unique properties unlike any other amber in the world. For many centuries since time began, people have used natures bounty for traditional medicine. What is sometimes referred to as alternative medicine is actually a mainstay medicine in many parts of the world today. As more and more people are reaching out for natural healing and pain relief, there is one remedy that is prevalent today and has stood the test of time - Natural Baltic Amber. One of the most ancient names of amber, electrum of Greek means I protect. At all times people took amber in the form of extracts and powders, rub into skin, breathe and mostly applied to the sore places. We recognize that amber has been around a very long time. But what is it that amber possesses that has made it a unique contributor to health since the beginning of recorded time? It has a substance or ingredient called succinic acid. A powerful anti-oxidant that helps fight toxic free radicals and disruptions of the cardiac rhythm, succinic acid has been shown to stimulate neural system recovery and bolster the immune system, and help compensate for energy drain in the body and brain, boosting awareness, concentration and reflexes, and reducing stress. Baltic amber contains 3-8% of succinic acid, a scientifically examined medical substance used in contemporary medicine. Recent scientific research has also proved that succinic acid has a very positive influence on the human organism. It strengthens the body, improves immunity, the course of energy-related processes and the balance of acids. In present day times, tens of effective medicines containing succinic acid have been manufactured and patented, especially in the USA and Russia. Of particular value are pharmaceuticals preventing the aging of human cells, which use succinic acid as an inhibitor (an agent slowing down or totally stopping the loss of potassium ions) and an antioxidant. Therefore, the acid may be called a scientifically described, modern elixir of youth. Succinic acid is also a valuable product for sportspeople. It is not a stimulant improving one's effort on a single event basis, but rather a stimulator of a balanced, comprehensive development. We are surrounded by all sorts of electrical devices: radios, television sets, microwave ovens, hair-driers, shavers, computers and mobile phones, which affect our organism. Modern research proves that we may protect ourselves against their negative influence by making friends with Baltic amber wearing amber jewellery, necklaces, bracelets, brooches, rings or pendants, or carrying a raw amber figurine or nugget in our pocket. Warming up, amber changes ionization, positively influencing our frame of mind and rebuilding the disturbed electrostatic field. Amber therapy is the new licensed method of treatment. Amber Therapy Room is such room, where walls, celling and floor are coated with an appropriate layer of unpolished Amber. Sessions of simple respiratory exercises are being performed in this room in order to facilitate penetration of negative ions to human body as well as massage of injured body parts and bioactive points with the help of massage device made from natural Amber stone, which increases level of Amber acids penetration to human body and stimulates regeneration and recovery of injured body parts. Amber is a natural medicine that helps fight both bacterial and viral infections. It is said to do many things including the reduction of blood pressure, improve the digestion of greasy foods, calm the nerves, sooth pain, improve healing and strengthen your immune system. It helps with tiredness, headache, flu, asthma, rheumatism, muscle aches, thyroid and heart problems. It is also used for whole body vitality and to alleviate stress. Certainly, thats a very big complement to Natural Baltic Amber but for those of us who have grown up with this amazing fossilized resin from an ancient forest, we are happy to have amber in our ordinary everyday lives - for its power to heal, restore well-being and relieve pain and stress. It is a friend that we just can do without. 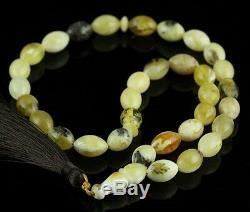 The item "Big Natural Royal Baltic Amber Islamic 33 Prayer Worry Beads Tasbih Misbah 21g" is in sale since Saturday, April 29, 2017. This item is in the category "Collectibles\Religion & Spirituality\Islam\Prayer Beads".2001" and is located in Ilion, Athens. This item can be shipped worldwide.